well this light novel give me "bakuman" vibe but this time it's around how light novel produced, author feelings, and a bit of romance. Great story with out of the norm plot and actual characters. But even if it's out of the norm, the plot isn't all that great, the characters development isn't so good neither and it even worsens the novel as they time skip. So 4/5 for the novel but Hyonomiya got that waifu traits so 5/5. I really, really like this novel. As someone that reads a lot of reincarnation web/light novels, reading a heartwarming slice-of-life story about an ebullient manuscript screener interacting with with a shy writer trying to express herself was a very refreshing change of pace. The characters have depth and are extremely likable, and the story moves at a good pace and wraps up nicely in the end. The author's insight into the world of manuscript screeners was also unexpectedly interesting. (This is my first time posting a review as this novel urged me to make one out of the blue) You'll know what I mean if you've read the novel. I would Highly Recommend this novel to everyone, especially for those who's looking for stories with a Slice of Life along with Romance and Youth tags this is gold. I really enjoyed this story, the context are well conveyed, and even though the main plot is nothing new, I can safely say that the story itself has its own fair share... more>> of uniqueness. What I liked the most was the romance between the MCs. As they were very pure and innocently falling in love with each other without realizing it for themselves and having their own worries and misunderstandings as they start to become aware of their feelings. All the characters are likable especially the main characters. The male lead has too many good points but has his own worries too while the female lead is reserved yet has her own adorable side which I liked btw. Overall, this novel is very heartwarming and will drive you different emotions as you read through. The illustrations are top tier. For me, this is one of the best I've read so far. The story was indeed short yet perfect as it is. A very beautiful Romance and SoL story. I personally don't consider it to be a School Life JP. I initially wanted to rate this 4 after reading till c4, but then by the time I completed, it jumped to 5/5. I will start off by saying that external looks considered, the characters are nothing new. It is what is happening inside their minds that makes this work a beauty. The way in which the novel that she writes is parallel to their relationship is just such a good thing... more>> to read about. The happy ending is a plus, and the protagonist isn't really dense... He is more of a cross between a beta and dense. He is wimpy. But who cares about him when we have one of the most real and well-written ice beauty female leads of all time!! And a good and limited support cast with a decent number of jokes- That is good enough. And this is only a single volume. Soothes my heart, I dare say. I will also say that this novel seems to be more of a direct communication between the author and aspiring writers, and also the people who judge them. And that is one interesting thing to read about. This is a good read, though still not at the must read level. However, I would call it a model good quality teenage romance novel with some real selling point to it. It is not just some random Slice of Life. It actually conveys us some meaning. That is more than enough for me to give it a 5. I am not too strict with my rating. Really a great story, I was all tears throughout the novel. I'm glad it was only one volume, it had perfect pace and as Ao would have said it, "Interesting and didn't leave a bad taste." Even though the ending was very satisfactory and I know they'll get together in the future, I keep cathing myself wishing Ao would have used a cheeky line, like "I wont let our story end like Cyan and Subaru's." What an amazing story. I loved how everything ended. The MC and Lead were so fun to read about. The story, in only 6 chapters, flesh out everyone relevant to the story so well compared to novels that have over 100 chapters.. What an amazing gem here. The genre this story belongs to is the one I find the most boring personally, but this story made me rethink about it. 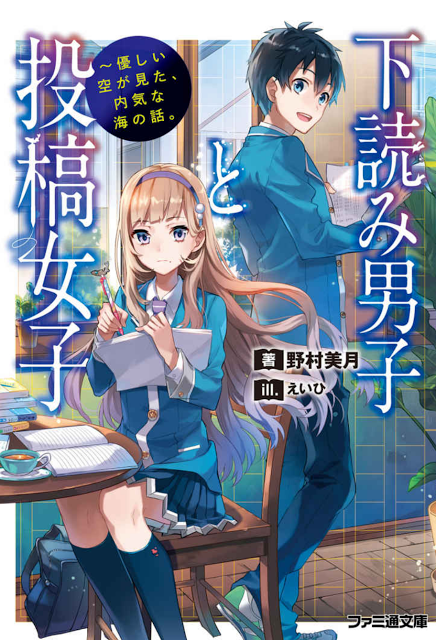 Story is about a manuscript reading boy who is broad-minded and is able to accept most things easily with a positive outlook, the girl is gloomy and likes to read and write manuscripts. Easy and simple right? Yes plot is simple and at times its cliché, but with a charm. Author uses many ways to describe art of writing a light novel and himself uses them in this... more>> book just right. It feels wonderful to learn this kind of thing since there are not many novels out there which teaches you while making you intrigued with the plot itself. Absolutely fascinating! Overall I would highly recommend this if you want a break and need some light-hearted casual reader with a good premised good pacing good romance and being informative at the same time. Brilliant. Just brilliant. 5 stars. Overall this is a light hearted, slightly cliche yet loved all the more for it, romance however it is also undoubtedly unique and peppered with moments that really pulled on my heart strings. What I think really made this LN though, from an english reader's perspective, is the phenomenal translator and editors who were able to bring my laptop screen to life. They have really done the original author justice, which is the first reason I would recommend this. To top it all off, the angle of... more>> a screenreader and LN was something completely new to me and as an avid reader I found I have gained a new appreciation for the hard work and nuances that goes behind the inspiration, the writing, the editing, the re-writing and so on behind the novels. As while there were times that I did get frustrated at the miscommunication between the two main leads and how despite, yeah the grandma had good intentions, face it. She was just cruel. Looking back those parts of the novel also kept me on the edge of my seat, a few times growling out loud in frustration, but nevertheless thoroughly engaged in the novel therefore originally 4 now to 4.5. A very short story about a boy who loves reading novels, and a girl who loves writing them. I highly recommend reading; if you want a chill romance that is far removed from the sess pool of over the top drama and horrible plot. A romance and slice of life beautifully constructed, full of feelings. Both the female lead and male lead complement each other greatly, and although is so good that more volumes would be a blessing it also managed to end shortly but excellently. Reading slice of life in a while is good for me. This story is great, I got a lot of emotion every time I read chapter, dragged me into story and its a wonderful feeling! *sorry for my bad grammar. of having them be together in the end.